Neman International has been operating under its present corporate name since 1985, but was founded by its principals in the early 1970's. As a family owned business, we are dedicated to outstanding customer service and the design and wholesale distribution of oriental rugs and carpets with creative flair and stunning colors. The company's years of operating experience and extensive inventory enable us to deal with a full range of clients, being capable of handling large volumes of orders at different marketing levels, including department stores, oriental carpet specialists and home furnishing retailers. Trade Fairs: Neman International exhibits annually at the NORS (National Oriental Rug Show) in Atlanta since 1982.
a yearly event in mid-September. Dealer support materials: include a full color photo album, flyers and digitally delivered photos via email. 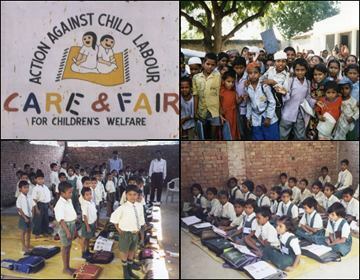 Neman International's charity work in India helps provide schooling for children and halt the exploitation of child labor. Specialties: Production of our custom designed oriental carpet ranges is concentrated in 3 major weaving areas - India, Pakistan and Iran.